One of the founding fathers of psycho-analytical psychology, Carl Jung, coined the concept of archetypes, subconscious concepts universally ingrained in the human psyche that embody a deeper part of our intelligence. Among the most well known of these is what’s called the Shadow Archetype, the living embodiment of the darkness within and without every heart, the part that acts with no restraint but in pure indulgent consumption. Jung said that the Shadow was what made man afraid of the dark in such a primeval way. But any child can attest that it is not the dark desires within themselves that wakes in them such a stirring fear when the world is without light, but rather that which dwells in the darkness. That their fear is real, and rational, and accurate, all because of what they feel and know watches and hunts them In the dark, living off of their life-force and growing stronger as time and emotion – is spent through the every day rigors of life. Those who have experienced this feeling of not being alone in an empty room, knowing that once the light is extinguished, a whole new level of horrors await them in the darkness that is to be. It is the cause for a fear of the dark, and with good reason. Every culture bears a creature that lives in darkness and follows the same pattern; imps, goblins, trolls, brownies, etc. Though references are fleeting, the Holy Bible makes several mentions of these sorts of creatures. Often translated as satyrs via the King James Version in a nod to Greek mythology and dismissed as a fantastic allusion, these creatures occupy a wider niche within the mythology of the day. These are called Se’irim, literally meaning “hairy beasts” or “goats”, the word is intended to denote a feral, bestial chimera pulled from some nightmarish realm. There are multiple origin stories on a local scale, usually involving some sort of witchcraft or vengeful spirit taking on the form of a walking shadow, others describe them as half-living creatures, never actually “born” but just a consequence of the existence of Darkness. From the Judeo-Christian mythos, their creation is attributed to the necromancing Archfiend of wrath, Ashmodai, also called Asmodeus, who in turn is believed to be the descended from the Zoroastrian “devil”, Angra Mainyu, the evil spirit of absolute destruction and adversary of the Creator. In this school of mythology, on the orders of the Morningstar (“Lucifer”) looking to supplement the ranks of his army during the War in Heaven, Ashmodai descended into the deepest circles of Hell. The precise purpose of his mission was to experiment with the Darkness of Hell, known in classical Greek cosmology as Erebus. It is understood in angelology that when the Lord created His angels, He did so by divine fiat, calling into the Light of Heaven, Aether, and each angel emerging once his name was called. Ashmodai used Erebus, in a polar reversal of the original act of creation, in an attempt to create a new generation of dark angels loyal to the Morningstar as the Angels of Light were to God. This bastardization yielded the unfinished, malformed, unnatural abomination that are the Se’irim. Though a far cry from the power and skill of Heaven-born angels, the Se’irim were a formidable swarm of creatures that the Morningstar deemed fit enough to satisfy his needs. On first arrival into this world, they are weak and relatively formless. They are indistinguishable from shadow and made of less than vapor. The only identifiable signs that one is present are the rapid and almost imperceptible flick of a shadow moving in the periphery or one’s field of vision and an accompanying shift in temperature and atmospheric electricity that requires hardware calibrated to scientific precision to discern from the usual environmental forces. This state lingers slightly, as these omens are quickly forced from one’s mind as an overwhelming sense of “eyes” takes hold and the primal awareness that one is currently being hunted or watched. Life is their sustenance and sole aliment. From the moment they arrive, they begin to drain life from their surroundings. Life is a very metaphorical word to be applied a foodstuff, and relative shifts in its presence or absence are almost impossible to detect. Rather, seemingly unrelated events give evidence to the presence of Se’irim. Milk curdling before its separated from cream, crops withering before the harvest, livestock being struck barren, and illness spreading among humans and animals in unprecedented rates – fears that belonged to our ancestors more based in agriculture all portend to the presence of these spirits. Though we have the means and technology to overcome these problems, the damage is still done, and the creatures strengthened. The act of feeding only increases the creatures’ hunger and makes them more whole. The more one consumes in a plane of existence, the more it begins to essentially belong to that plane, reducing the amount of strength required by the Se’ir to stay constituted and not dissolve back into shadow. This gradual change is observable as the Se’ir begins to gain substance and form. No longer a darting shadow, they assume a form that earns them their name. Described in various combinations of simian, canine, reptilian, and even vaguely human traits, the finer details of their appearance vary between cultures, but invariably are based on what they have been feeding upon or were created to feed upon. Between their forms of spirit and flesh, their shape is as it will eventually be, but their skin remains the same living darkness, oily black and covered in obsidian quills. It is the “in-between”, or “incomplete” form that poses some of the most unique dangers; the beast is physical and established in this world, however, it retains its preternatural qualities of speed and stealth, all the while continuing to feed until it reaches its final physical form. The final stage of its growth is that of a functioning organism, its skin takes on dusky brown or gray tones to blend in with its surroundings, its claws are mineral and sharp, its blood is a curdled poison, and its fur lies in an impenetrable, matted cloak around its form. Its heart beats, its lungs breath, and it hungers, no longer satisfied to drain the essence of life or some form of energy from its surroundings, is only contented, with warm blood and raw flesh. Its body even gains resistance to things which would normally spell its end in a given scenario such as prayers, charms, and incantations against it. If one were to encounter a Se’ir in this form, (shortly before claws ripped into their thoracic cavity) they would consider it as an undiscovered species of primate or large rodent. The only thing that betrays them as something other at this point is when it steps back into shadow and its sunken, lamp-like eyes begin to glow like hellfire, as its face splits open in a jagged mouth to reveal countless conical teeth in an unmistakable jack-o-lantern grin. While that may sound dramatic, there have been many, many alleged sightings of creatures such as this within the deep wilderness. 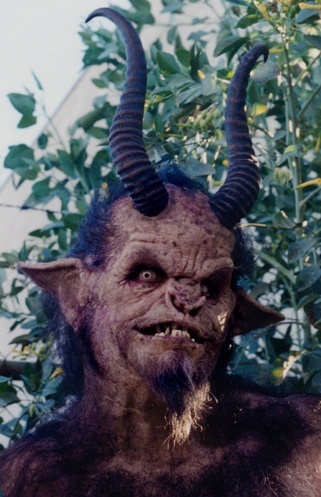 Among the times of the Greeks, one of the more famous Satyrs was “Pan”, made famous in modern cultures recently in such movies as “Pan’s Labyrinth”, as well as other satyr-like demons such as the main demonic character from the movie “Insidious“, also about diabolical infestation, oppression, and possession. You can read more about them in the PDF files posted above. “I called out to the others, but no one responded. I knew something was going to happen, that some type of manifestation was going to take place, but what exactly? I got up, waiting for something to happen, but there was nothing. I turned and faced the opposite direction. At the top of the stairs, a physical form took shape. It was verbally responding and took on a full form. It kept saying over and over, ‘You know what they did, you know what they did to us.’ Within seconds, the reptilian-like body descended down the stairs toward me. It was not a complete full-formed being, but had features that were easily recognizable. As it came toward me, its murky colors were much stronger and directly behind it were quick, fluttering movements. “Needless to say, it was not long after that I left the premises, grabbing my keys within seconds. It would be three days before I would return to the house. During those three days, I withdrew from the Work and all those who were associated with it. I really did not think I was going to ever return to that case or any case again, but I did. With these creatures, several demonic names always arise as the masters over a great number of the beasts. Ashmodai as the creator of the Se’irim, devised for himself a special class of the Se’ir demons most well known in Zoroastrianism as Dæva, described as larger than the usual and always remaining in the in-between state of shade and flesh. Also distinguishing is their particular suitability to navigate and act in the Spirit World undetected. Aside from Ashmodai, another master, or rather mistress, of the Se’irim is one often called the Witchqueen, Lilith. Hers are a peculiar brood of Se’irim in respect to their creation and naming. Called Lilin, from the Akkadian Lilitu, they are the oldest recorded vampiric creatures that embody the dark and chill of night. Lilith’s only mention in the Biblical canon is in fact accompanied by a mention of the Se’irim, but the origin of her specific class and breed lie in Hebraic and ancient Near Eastern lore. The first woman and original wife of Adam, Lilith abandoned her role as mother to mankind and companion to Adam in favor of personal power, fleeing Eden and retreating to the wilderness to hide from the Lord after committing prime blasphemy. Before the Lord sent His angels to retrieve her, she was discovered by Samael, the Venom of God, who is called the Prince of Hell and the only angel who’s wickedness rivals (and in some views surpasses) that of Lucifer himself. During their stint of cohabitation, Samael indulged in his most sadistic pleasures while Lilith gained knowledge of the most arcane and wicked arts, twisting her very soul into something unrecognizable. From this unholy union, Lilith conceived the first generation of her viper’s brood. Having never tasted of the Fruit of Knowledge as Eve later would, Lilith remained immune to mortality and bore “children” by the hundred with no birthing pains. From the mingled blood of primal humans and the tainted seed of the fallen Angel of Death, the Lilin were spawned already dead so that they may live by stealing life. When the angels Senoy, Sansenoy, and Semangelof finally discovered the abomination, the Lord ordered them to slaughter the beasts with flood waters, tempest winds, and fire from Heaven. Surviving the maelstrom, Lilith returned to the Garden to find Adam now with Eve and destined to populate the world. Incensed that Eve could replace her, that she would bear children while Lilith’s had been destroyed, Lilith fused her twisted soul with the spirits of Samael’s demonic concubines to form a single witch of unrivaled power. Every generation of Lilin that followed were born from this black-magic amalgamation and were ordered to prey on the children of men and steal the breath from sleeping babes in a form described as creeping in through bedroom windows, slinking like skeletal black cats. In modern times, we refer to this scenario as SIDS, or Sudden Infant Death Syndrome, to which we still have no definite cause or cure. This phenomenon was so greatly feared in ages past, that extensive amulets were carved into children’s beds and cribs taken from the mystical Hebrew text of the Book of Raziel, while Babylonians prayed to the demonic deity of storms and chaos, Pazuzu, or Azazel in Hebrew, believed to be the only entity in which Lilith fears. The final and most notable Se’ir master is the aforementioned Archfiend, Azazel. It’s the association with Azazel, the Devil in the Wilderness to whom biblical Scapegoat offerings are directed, that Se’irim receive their name, “goats,” or Satyrs as they are called in Isaiah 34, when mentioned among their fellow monsters, Lilith included. The Book of Leviticus details the redemptive rituals of Yom Kippur, the crux of which focuses on the sacrifice of two goats, one to the Lord, the other the Lord deems to be endowed with the sins of the Israelites and cast out into the Wilderness outside Jerusalem to be slaughtered by Azazel, taking the sins away with the goat’s life. From the blood of the sacrifice and a year’s worth of incarnate Israelite sins, the Devil raised a clutch of Se’irim designed to wander the desert like himself and drain all life from the barren landscape. Like Lilith, this is neither Azazel’s first experience with Se’irim nor his original breed. During the War in Heaven, Azazel was issued an immense force of the original Se’irim in numbers larger than even Ashmodai’s. With this army, Azazel formed an alliance with the Djinn/Djinni who also refused to submit to God, and attempted to occupy the whole of the Earth. Azazel’s second generation of his own design are recorded within the mythologies of the Mediterranean regions under the moniker of “Satyr”, distinguished by their more rugged and bestial appearance along for what can only be described as insatiable lust. Though similar to incubi in certain respects, their particular revelry, combined with the corrupting presence of their master, drive women to insanity. But the ability to conjure Se’irim is not limited to these specific Archfiends. Though the methods are a darkly guarded secret of fallen angels, as they should, the rituals involve creating a massive shift in the balance inherent to Nature, like the stretching of a guitar string far out from its neck and allowing it to snap back against the fret board, the resulting, dissonant “twang” is amplified and resonates using the qualities of the instrument designed to project its sound. However, unlike the instrument, which can be retuned quite easily, this act leaves a scar upon nature in the vicinity of its performance that takes longer than the abilities of human reckoning to return back to its proper tune. To achieve such an unholy dissonance, a great act of evil is required, becoming more unnaturally heinous depending the number of Se’irim conjured from Erebus to the location. Most often in the lore, an act of sorcery or witchcraft is combined and augmented with the mingling of a physical embodiment of cosmic evil with sacrificial blood. A prime location for such a summoning is within a human being. Mazikin, the Aramaic word for demons capable of possession, summon Se’irim after inhabiting a human vessel, using the unnatural process of possessing another and a blood offering from their victim to create a host of Se’ir assistants. These act to absorb the immense life force emitted by the soul, reducing the possession victim’s ability to resist while keeping them imprisoned in darkness. In the famous case that inspired William Blatty’s novel The Exorcist and its subsequent film, the afflicted child reported a vision of his salvation at the end of his possession ordeal in which the Mazik lost control and an angel drove it out, burning away its Se’irim. Despite deadly force and countless numbers, Se’irim are plagued with a host of vulnerabilities. Though never falling for the same trick twice, there are undeniable constants that they cannot avoid, many of which exist due to their nature as extensions of their summoners. Light is the ultimate bane of Se’irim. Light creates shadows by a force causing the absence of light, so Ashmodai, a being made from the Light of Heaven, created the Se’irim from the dark void of Hell, but just the same, light extinguishes darkness. While light, be it from a fire or some other source, repels the creatures, they are utterly annihilated by either lightning strike or sunlight. At the first light of a new day, Se’irim are forced to nest back in the dark place in which they were summoned. To a great degree, it is from this tradition, noted especially in the case of the Lilin, that the popular tradition of vampires burning in sunlight derives. Among physical weaknesses, silver is always lethal to Se’irim, it efficacy only surpassed by sunlight. Consecrated iron will wound Se’irim, causing them to “bleed”, and from this effusion (though itself poisonous) the very life they have stolen is emitted. In this form, the life will be taken up by whatever is around it, be it the ground it soaks into, whoever struck the Se’ir, but also other Se’irim surrounding their wounded fellow. Unfortunately the more critical the wound, the more the outpouring of life will attract Se’irim, chumming the waters so to speak. One’s only guarantee with this method would be to make the strike absolutely critical, dispatching the Se’ir instantaneously. Without the creature attempting to hold its form, the force of life is altogether released throughout the whole of the area. It is difficult to pinpoint the exact location of such a kill stroke on the creature, it can be said that the best approximation would be its “head”, more specifically its glowing eyes. The most notable exception to iron are Satyrs. Anticipating man’s use of iron in his most deadly weapons, Azazel proofed the beasts against iron’s devastating effect. The only value of the metal known is in respect to the mechanical pressure it can apply, in other words, how far the creature can be flung away from oneself after being struck by the iron instrument. However, there are magics still affecting them which cannot be overridden. In the specific case of Satyrs, flint readily penetrates their skin and inflicts wounds from which they cannot recover. As mentioned, fire repels Se’irim, and flints most distinctive feature is its ability to shed sparks when struck, leading to its mythological role as the physical vessel of Primal Fire. Equally so, flint was the stone on which man distinguished himself from animals, flint being the prime material for tools for countless millennia in man’s distant past and the source of man’s greatest tool, fire. Also effective specifically against Satyrs is orichalcum, meaning “mountain metal,” understood to be various natural and artificial alloys of brass and bronze. Though common sounding, this metal was understood by extension to be more than just brass, but a mythic alloy valued most next to gold. This mythic status of a metal is seen again in later ages with the first appearance of steel and the magical qualities attributed to it. While the exact process was unknown to the smiths, every so often an iron sword would be different – and it was understood than some form of magic or alchemy had altered the metal to this new form. Very notable cases of such “magic” swords include the Sword of Fierbois belonging to Saint Joan of Arc, Joyeuse the sword of Charlemagne, Roland’s Durandel, Oliver’s Hauteclere, Ogier’s Curtana, and Arthur’s Excalibur. Alloy weapons, like flint, represent a leap forward in humanity’s progress, and every step taken towards progress is a step to thwart the efforts of Azazel against him and all the powers the Archfiend commands. Coincidentally, alloy metals and are associated with the Archangel who defeated Azazel in Jewish mysticism. The widespread presence of Lilin and their particular vampiric actions has greatly given them distinction, entering a class very uniquely their own. Their unique weaknesses are reported in traditional vampiric lore, most notably their inability to cross moving water and their obsessive compulsive need to undo “knots,” breaking both binding magics and literal knots. This is again an extension of their progenitrix. Though Lilith’s power is nothing if not considerable, there are several occasions in Judaic lore in which she is rendered powerless after being bound by an exorcist’s prayers, a Talmudic example includes the Prophet Elijah going so far as to extract the names of her demonic side while in this state. Physical knots bear another layer of symbolism concerning the ancient practice of sealing prayers and sacred incantations in knotted string, the knots on the Jewish tallith being an example of such sacred knots. Spells may also be formed in this manner, in a practice Levitical law actually lists as a form of magic forbidden to Aaronic priests. Lilith, as a witch, takes note of such practice, literal and metaphorical, and regards it as competition, using her Lilin to undo the magic of others in a move towards supremacy, as well as a preventative defense mechanism against the possibility of an exorcist binding Lilith’s demonic half as has been recorded in the Talmud. I had told everyone that sometime in the near future, a new writer, ANIMUS, would be stepping up to the plate, and delivering some unique and original content to DiabolicalConfusions. After reading this article, I was blown away. The amount of information that was included, as well as the sheer amount of research and fact-finding that had to be completed for this article to make sense to the average reader was nothing short of astounding. With that being said, the Se’irim pose a significant threat to all those of us who dare to step out of the darkness, and into the light. We saw that they have a very obvious connection with the “shadow people”, of which a previous article has been written on this site, as well as the elusive and powerful species of Islamic origin, the Djinn/Djinnis. I learned that they are affiliated with other higher-level demonic entities, such as Ashmodai/Asmodeus, Azazel, and the mother of all demons herself, Lilith. This is a terror that dates back to the dawn of man, and they give us a significant cause to fear what lies within the dark. In his attempt to explain what these creatures may look like, I tried to find some freely available images on the internet of what the most famous version of these creatures, the Satyrs, may look like. It’s important to note though, that not all of these entities will look like a satyr, and to remember that there are many generations and variants of the Se’irim. Just like the angels have rank by depending on which choir they are from, so too do demons, and their creations have been used many times for many reasons throughout history, so to claim that we know exactly what they look like would be foolish. For all we know, we may find a Bigfoot/Sasquatch one day, and discover that he is in fact one of the Se’irim. We simply don’t know. What caught me off-guard most was perhaps the fact that these Se’irim can, and have been conjured by other, more experienced and more powerful demons throughout the course of a possession. While ANIMUS cited the work The Exorcist by William Peter Blatty, a fictional case of possession, what springs to my mind is a book written in November of 1983, by a man named Gerald Brittle. The name of the book was “The Devil in Connecticut”, and it was released by Bantam books, ISBN 0-553-23714-4. In this non-fiction work, the possessing demon of a small male child called in “re-enforcements”, to assist him in guaranteeing the full-blown possession of not only this child, but other members of this child’s family as well. This particular tale has been the cause of much debate, based on the fact that as the child got older, he and his brothers claimed that they wanted to change their story, and put on the record that they all believed that the child, now fully grown, had been suffering from mental illness, and that they were just exploited by demonologists and the author. While this has caused a great debate and spawned several legal cases, some of which have successfully banned the book from being sold, I have no doubt in my mind that the possessing demon in this case had summoned some of the Se’irim, a total of almost forty of them, if I recall correctly. ANIMUS also tied in some other aspects on how you can protect yourself, with one of those methods being iron, another article which has also been written on this site, and in closing, has shown us why, aside from Jung’s assessments, man has a valid reason to fear the dark. So think back, to all of those times that you have seen a moving shadow dart quickly around in your peripheral vision, or that time you could’t explain why you felt as if the corner of your dark bedroom was “watching you”, when you knew you were alone. Know that while many would say that it is all in your head, there are also many of us that would acknowledge that something just may, in fact, be there.